Having the right cat treat for your kitty is important to some cat owners. Treats are fun to give and are a nice way of bonding with your cat. Here are some tips to help you choose the best cat treats for your special kitty! The ideal cat treat is one made of good quality ingredients, moderate to low in calories, consistent in ingredients (thus unlikely to cause stomach upset from bag to bag), and very appealing to your cat. New cat treat formulations that minimize dental tartar may also be beneficial to some cats however the overall effectiveness of this relative to the teeth is debatable. The Association of American Feed Control Officials (AAFCO) publishes feed regulations and ingredient definitions. If the cat food (or cat treat) follows the guidelines set forth by AAFCO, the label will include a statement that says "Formulated to meet the AAFCO Cat Food Nutrient Profile for Kittens/Adults/Senior.”) Some companies create treats to be in compliance with the AAFCO standards, most companies producing cat treats do not. It is also ideal if the treats you choose don’t cost you a fortune! Choose a cat treat that is complete and balanced and ideally formulated to meet AAFCO approval. Good nutrition may be the most important factor affecting your cat’s health. This is especially true in growing kittens. Feed the best quality food you can afford. Do NOT supplement cat treats for a good quality cat food diet. There is nothing in a cat treat that is nutritionally required for your cat if he or she is on a good quality food. They are just that, a “treat” or a “snack”, not dissimilar to potato chips or a Snickers bar for us. We like it, but don’t necessarily “need” it. Consider low-calorie cat treats for cats with weight control problems. Another alternative is to break up cat treats into small pieces to make them last longer, thus giving less (and less calories). Some cats really like canned food and consider that a wonderful cat treat. Some cat owners’ feed small amounts of canned food twice daily to supplement their cats core dry food diet. The benefit to this approach is that it gives you a good opportunity to observe your cats’ appetite twice a day which is hard when feeding only free choice dry food. 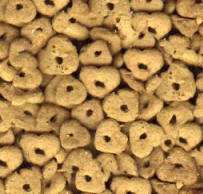 Another economical option for a cat treat is to feed a different dry food as a treat. The new formulations of the Fancy Feast® Gourmet Gold™ dry formulations are a favorite of many cats. The dry formulations come in Chick & Turkey and Ocean Fish & Salmon both which are AAFCO approved. If you want to feed a good quality diet such as Hills® Science Diet® as the core dry food diet, you could supplement with a few kibbles of dry Fancy Feast as a special “ cat treat”. It is not a requirement to meet AAFCO standards in order to sell cat food or cat treats, so buyers beware. Check the labels and compare products.